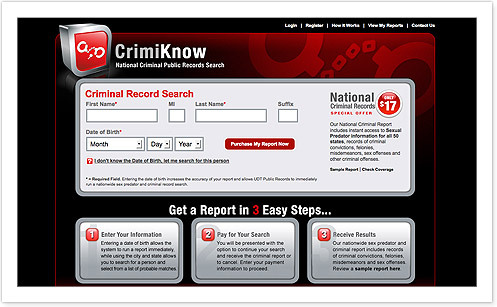 CrimiKnow is a nationwide search product on public records. CrimiKnow's data is updated each month, as soon as our providers update their records we deliver that information to you. Our philosophy is to bring consumers the best information in the marketplace, at the best possible prices. We also make it very easy for our customers to search for records and not offer numerous confusing options CrimiKnow keeps your search options simple. This method of searching allows you to focus on your subject and find the appropriate criminal records.